Evidently it’s the “list” time of year, and so far black girls are winning. On Tuesday, People magazine debuted its 50 Most Beautiful issue, starring none other than media (and fan) darling Lupita Nyong’o on the cover. 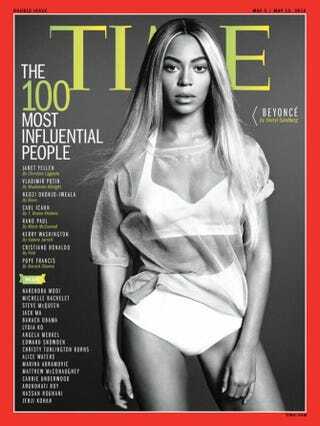 Not to be outdone, this morning, Time released its annual 100 Most Influential People issue, featuring singer Beyoncé on its cover. Nyong’o’s issue went over pretty well (at least in my circles). Beyoncé’s, though? Um … not so much. I’m far from being Beyoncé’s biggest fan—though I love the latest album—but it’s hard to argue that she doesn’t have the influence to earn that Time-cover spot. I expected people to try to argue against it anyway, because, well, that’s what the Internet is there for. But nope, folks surprised me. Instead, everyone’s talking about what Beyoncé looks like on the Time cover, as if she’s over there with Nyong’o on People’s Most Beautiful cover. And, my favorite criticism masked as concern: “Um, where are her pants?” which is actually a legitimate question. In all fairness, would a man ever appear (or be asked to or allowed to appear) on the cover of the Most Influential issue in his underpants? And even if he did and it wasn’t the most flattering picture, would he be ripped this way? Would we notice? Or would be all be too busy discussing the merits of his influence (fair game for a cover about, well, influence)? Beyoncé’s continued reign as the queen of pop culture and a woman of great influence (evidently) means the critiques are fair game. But part of me wonders if there’s ever a time just to lay off and acknowledge when someone is doing the damn thing—despite what they look like. I remember many years ago when Lauryn Hill landed the cover of Time—and not for the Most Influential issue. It was a really big deal because black girls just didn’t—and don’t—get Time covers all willy-nilly. So while I have my occasional concerns about brand Beyoncé—and for clarity, I agree this isn’t her best picture, but it’s also far from her worst, and who cares because she’s on the cover of Time, people!—sometimes it’s just, well, time to put all that other stuff aside to celebrate a black (and female) face in a high place, knowing how hard she’s worked to get there. Because you have the right to complain about everything doesn’t mean you should. And knowing when to lay off complaining and just think, “Congratulations. Good for her” is the difference between sounding like a critic and sounding like a hater.